Modern cars and many older cars, have something on the rear side of the radiator surrounding the fan. This shroud or cowling helps pull air through the radiator when the fan is on. Since auto makers don't spend a penny where they need not, I have come to the conclusion that the shroud helps keep temperatures down. 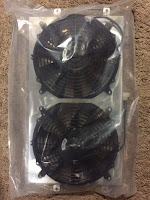 Initially, I thought it was to protect fingers when the fan snapped on, but I've since learned from reading articles that these shrouds do help pull air through the radiator and can reduce temperatures by up to 40%. Since I did the engine swap on Hapy, he had been running without a tailored shroud. I put a cowling of sorts around the outer edge, but that was mostly to help keep the waste hot air from re-circulating into the radiator intake. I'm not sure how well that worked, but let's assume it worked okay. 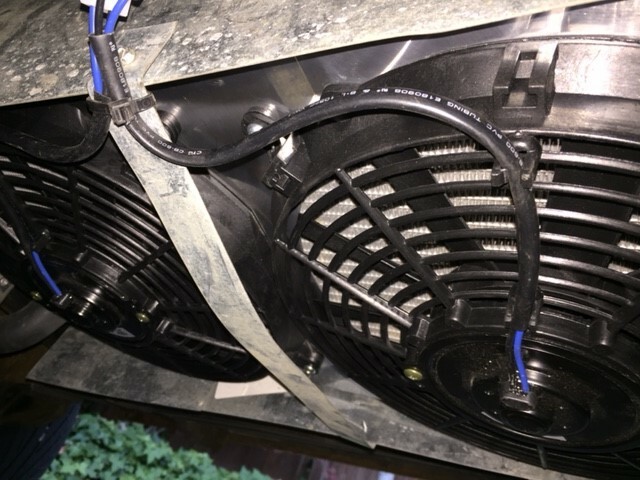 I had 2 fans on the bottom, with the intent to pull air through the radiator, but it is entirely possible that lots of air leaked around the edges of the fan, greatly reducing their cooling capability. So, I went to eBarf looking for an aftermarket shroud, in hopes of finding something that could bolt onto the new Mishimoto radiator. While I could have fabricated one, if I could find one inexpensive enough, I'd go with a bolt-on. The radiator size I have is from a Jetta3, and fortunately, there are many of these still on the road, creating a market for things like an aftermarket shroud. I had to try a few sources, though, as the supply is drying up, or those who manufacture and import them have been carefully managing their inventory due to the new import tariffs. Anyway, I found a seller and $90US on eBarf later, I have a direct-replacement shroud with fans. The mounting holes lined up perfectly with the mount holes on the Mishimoto radiator. This made the install crazy easy. I cut the cable-ties (zip-ties) which held on the old fans, unplugged the wires and set them aside. 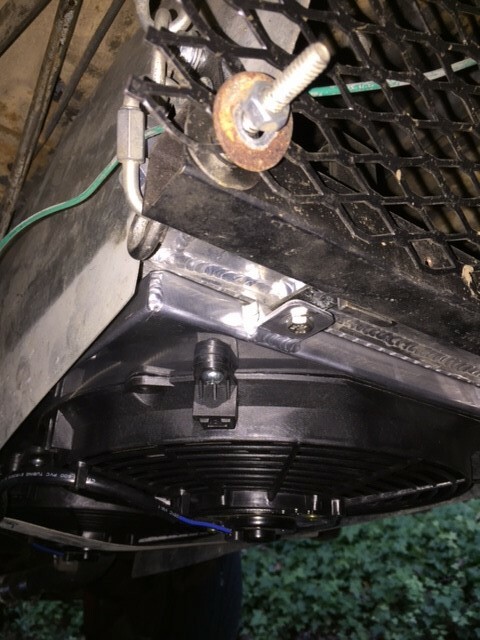 I cut the plastic bag off the new shroud and slid it between the radiator and the metal strap which holds the sides together (see the bottom picture). 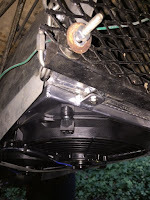 I removed the 10mm bolts which held the radiator to the support frame, fit the radiator mounting tabs into place and re-threaded the bolts into their respective holes. Once the wires were plugged back in (black to ground, blue to switched 12V from the relay), the install was complete. I flipped the fan switch on the dash to confirm everything was good (both fans spinning, and both in the right direction). them for the MGB. With the new cowling and fans, I hope the days of watching my temperature gauge are over. We could have a few nice days ahead, but rains are pretty much upon us now, so the likelihood of getting a hardy test before spring is unlikely. Regardless, I expect that it is no worse than it was. If so, I can easily revert back, but that would be quite a surprise. With the conclusion of this effort, Hapy is back "in the bag": covered with the BusDepot bus cover for the winter. It is always a sad day when we cover him up, knowing that the summer didn't quite have as many camping or festival adventures as we wished. I sincerely hope that I can get him uncovered and out for drives early enough next season to shake out the issues so we can have an adventure-filled summer.